Tip provided by Brady Infrared Inspections, Inc. Maximizing the effectiveness of an infrared inspection of electrical systems requires that all energized equipment be inspected. In this week’s Tip, we discuss how thermal imaging can be applied to programmable logic controls. Programmable Logic Controls (PLC’s) are commonly used in manufacturing and industrial facilities to automate processes. A typical PLC cabinet (Figure 1) contains circuit breakers, power supplies, card readers/output modules, fused circuit boards, and numerous terminal connections. The intricate design of PLC cabinets can be intimidating to an inexperienced thermographer; however, most PLCs are similar with respect to their major components. A proper understanding of these components and their functions is imperative for accurate thermographic diagnoses. Within a PLC, circuit breakers provide protection from overloads and/or ground fault. Power supplies provide the appropriate voltage and type of current needed. Output modules are either 120V AC or 24V DC depending upon the automated application. Output modules also provide access for computer programming. The fused circuit boards serve as the communication link from the output modules to the automated stations. Heating on connections and components in PLC components can cause automated equipment to drop offline disrupting production. The most common problems detected with a thermal imager include loose connections and defective internal contacts on molded case circuit breakers. More subtle problems include defective cable connections to circuit boards (Figure 2) and failures of laminated circuit board ribbons (Figure 3). Problems with output modules can also be detected. Normally, these components exhibit a thermal gradient that transitions from warm to cool when viewed from top to bottom. Thermal patterns showing heat propagating through the entire module signifies trouble (Figure 4). Using infrared thermography to identify PLC problems can assist E&I technicians in their troubleshooting efforts and provides another step towards increasing uptime and reliability. Did you know that an automobile can be used to gauge solar loading? Under the correct conditions, a parked car can serve as a cheap, but effective, pyranometer. Many types of infrared inspections rely on solar loading to heat the target so that infrared imaging may be performed successfully. Applications include, but are not limited to, low slope roof inspections, concrete bridge decks, storage vessel levels and latent moisture within building sidewalls. Ensuring that enough solar loading has occurred is imperative to collecting good data. Good solar loading conditions are easy to recognize – long days with bright sunny skies, low humidity and no wind. More tricky is being able to determine if less than optimal conditions are allowing for appreciable solar gain. A time tested method for gauging solar loading is to check the interior of a parked automobile. With the engine stopped and the windows and doors closed, allow the vehicle to sit in the sun for up to an hour. Immediately upon opening the door, check to see if the vehicle interior has exceeded outdoor ambient temperature. If a noticeable difference is not detected, feel the dashboard to see if it has warmed. If not, it is likely that appreciable solar loading has not occurred and it may be best to reschedule your solar driven inspection for another day. Objective specifications are frequently used to describe the performance of thermal imaging systems. In this two-part Tip, we explore the significance of two commonly used, but frequently misunderstood terms: Accuracy and Sensitivity. Infrared cameras along with most other electronic measurement systems have to manage their own sources of measurement error. These error sources include detector electronics, signal-to-noise ratios along the signal path, non-linearity, thermal drifting of components, gain/offset adjustments, and a host of other internal electronic workings in the measurement chain of the camera. Each component adds its contribution to the overall error of the camera as a measurement system. Because many electronic measurement systems are similar in function, that is to detect and convert real world analog information into digital numbers, they all tend to use the same two specifications called “Sensitivity” and “Accuracy”. These two specifications combined describe the unit’s ability to state how close the converted value will be to the actual value of the input. The Sensitivity specification for an infrared imager states the smallest amount of detectable change in the level of radiant power the camera can sense and convert into a digital number. Any change in radiant power smaller than this amount will not be recognized by the system. It is usually a very small number, (near LSB level in digital terms) and for infrared cameras it’s commonly stated as a fraction of one degree C. Typical specifications for Sensitivity are in the range of .2°C , .1°C or .06°C at a given temperature such as 30°C. Because Sensitivity values are calculated using a blackbody simulator under laboratory conditions, they represent a best case scenario. An imager’s sensitivity can be significantly affected when imaging real world targets. Factors which influence sensitivity include, but are not limited to: target temperature, target emittance, and imager measurement range. In part 2 of this Tip we will discuss the topic of Accuracy. Objective specifications are frequently used to describe the performance of thermal imaging systems. In part two of this Tip, we explore the significance of our second frequently misunderstood term, Accuracy. For an infrared camera, the Accuracy specification states how close the camera’s measurement of radiant power will be to the actual radiant power emitted from a target. Things would be less confusing if this spec was called “Inaccuracy” or “Allowable Error” because it is really stating how inaccurate the camera is allowed to be. The “Minimum” part of the spec is expressed as a window of temperature where what is measured is guaranteed to be no further away from the actual input than this spec. A typical specification is “± 2ºC”. This part of the spec covers the camera’s error or inaccuracy when dealing with lower levels of radiant power or lower temperature targets. The “Maximum” part of the spec is expressed as a percentage of the measured value where what is measured is guaranteed to be no further away from the actual input than this spec. A typical specification is “± 2%” of reading”. This part of the spec covers the camera’s error or inaccuracy when dealing with higher levels of radiant power or higher temperature targets. As the measured value gets larger, the relative contribution from error remains the same as a percent of the total measured value, but its absolute value goes up. For example, 2% of 100 is “2”, but the same 2% of 1000 is “20”. As the measured temperature value increases to say 500ºC, then the ±2ºC spec is inadequate to express the camera’s accuracy because 2ºC out of 500ºC would be less than .05% error and that is not what the camera can do. This is why the percentage of reading ( ± 2% of reading) component of the spec is needed and why for larger measurement values IT now becomes the dominant factor in the Accuracy spec. And just to make sure the entire range of accuracy in the camera is covered regardless of the measurement value, manufacturers add the statement, ”whichever is greater”. Imagine a marksman shooting at a target and we want to describe his ability to hit the bull’s eye mark every time, or more appropriately, define how far away from the bull’s eye he is allowed to deviate. Let’s also define how tightly his shots will be grouped. But here is the problem: hitting the bull’s eye and making tight groups are two separate talents our marksman possesses. Although they are related, they do operate independently in this shooter and therefore need to be discussed and defined individually. For our marksman, we’ll assign some infrared camera specifications to his shooting so we can set expectations as to his anticipated performance. Expectation – Our marksman is allowed to miss the bull’s eye by up to 2 inches; greater inaccuracy is allowed as distance to the target increases. As you can see in this example, his grouping talents do not help him in hitting the bull’s eye. By specification he is allowed to miss the bull’s eye by up to 2 inches. Regardless of a camera’s fantastic “Sensitivity” spec, it is allowed to miss an accurate temperature measurement by its “Accuracy” spec! n his commentary, ‘The 35 Undeniable Truths’, Rush Limbaugh states, “Words mean things.” This is especially true in thermography when it comes to one’s certification. Certification has long been recognized as an indicator of a thermographer’s formal education and/or qualifications. Certification can have significant financial implications since buyers of inspection services often base purchasing decisions on a thermographer’s level of certification. Unfortunately, misstatements regarding certification, in particular ASNT certification, are quite common. First of all, ASNT Certification – certification issued by the American Society of Nondestructive Testing – is only available from ASNT Headquarters in Columbus, Ohio. This certification program is designed to provide uniform testing and certification of NDT personnel that is ‘transportable’ when an NDT technician leaves the employ of a company. The use of the title, ‘ASNT Certified Thermographer’ is incorrect since ASNT does not use or recognize the term ‘thermographer’ in any of its professional designations. The correct term is NDT person or NDT technician. Although ASNT does offer Level II certification in some NDT disciplines, they presently do not certify anyone below Level III in the Thermal Infrared (TIR) Method. Therefore, titles such as “ASNT Level 2 Certified Thermographer” or “ASNT Level 1 Certified Thermographer” do not exist except on the websites or advertising materials of companies who believe they have earned such titles. There are many examples of such citations ranging from infrared consultants to top executives at infrared equipment manufacturers. Perhaps the biggest reason that considerable confusion surrounds ASNT certification is that some infrared trainers provide misleading information on this topic. Further compounding this problem is that many thermographers are imprecise when they represent their credentials. Few thermographers who do misrepresent themselves are rarely called to task by their peers or their clients. Ethics within any profession demand that practitioners always represent their qualifications and credentials accurately. Because words do mean things, thermographers must be careful when representing their qualifications and avoid using titles that do not exist. Accurately describing your certification reflects not only on you but on the credibility of our industry as well. The topics of ASNT certification and how to establish ASNT-compliant certification programs are two of the many topics covered in depth within the Infraspection Institute Level III Certified Infrared Thermographer® training course. For more information on course dates or to register for a course, call 609-239-4788 or visit Infraspection Institute online. If you did hear the question, your index finger should twitch. Your index finger is trying to remind you to ask yourself, “Did I understand the question?” There are lots of reasons why you might not understand a question; you don’t know a word, a word you know is being used in an unknown context, the question assumes a fact which is not true or not in evidence (of the “when did you stop beating your wife” variety), or the question is a leading question that incorporates a statement which it asks you to admit or deny, and as phrased you can do neither (such as, “You were wearing pants this morning when you hit my client, weren’t you?”). Sometimes, the question isn’t even a question, but a form of copspeak, a statement coupled with a pregnant pause. (Here your lawyer should jump in and state loudly for your benefit, “Objection as to form. No question pending.”) We must also admit the possibility that you are a dullard, the question is beyond you, and this whole business of questions reminds you unpleasantly of school. If you heard and understood the question, your middle fingertip will press against your leg, insistent that you ask yourself, “Do I know the answer? If not, is it because I don’t know the answer, or because I forget the answer?” This distinction makes much more of a difference on the stand than in regular life. If you knew something but forgot it, your recollection can be refreshed and introduced into evidence. If you never knew it, your testimony is not competent on this point, and is thus worthless forever. Sorry. Should you reply, “I don’t know,” expect the follow-up question, “Well, who would know?” Look blank, and start on your thumb again. If you know who would know, say so and stop talking. Otherwise, feel free to say you don’t know who would know. They can’t mess with you this way. Should you reply, “I don’t remember,” expect the follow up question, “Can you think of any documents which would tend to refresh your recollection?” Look blank, and start on your thumb again. And so on. If you know the answer, your ring finger will tap and twitch to tell you that you are in the greatest danger of all. The pressure of your ring fingertip against your leg reminds you that you must answer the question truthfully in a manner that is only apparently helpful, and then stop talking. Answer only the question asked, which you are now presumed to have heard and understood, and coming to the very first period at the end of the very first sentence of your answer, stop talking. Stop talking. STOP TALKING. Do not answer the question you believe should have been asked; do not tell the questioner what you think she needs to know; do not answer a question with a question; do not object, or protest to your lawyer or the judge, “Do I have to answer that?”; do not preface your answer with an aside such as, “Can we go off the record for a minute here?” Instead, respond only to the question asked, as briefly and as generally as you can get away with, without obstructing justice. Do not blather, do not be helpful to the questioner, do not be funny, do not let your temper run away with you, do not lie. Answer in as few words as possible and then, you guessed it, stop talking. And your little finger? Well, your little finger goes, “wee, wee, wee” all the way home. We thought you knew that. 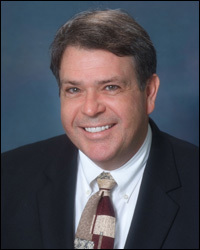 Bob Incollingo is an attorney in private practice in New Jersey and a regular speaker at Infraspection Institute’s annual IR/INFO Conference. Everyone who has performed infrared inspections outdoors on sunny days is familiar with the problem of solar reflections. Compensating for solar reflections is usually accomplished by repositioning the thermal imager to change the viewing angle to eliminate the reflection. For objects exposed to strong sunlight, a more insidious problem can occur in the form of solar loading. The concept of solar loading is familiar to everyone: objects exposed to the Sun will heat up. In general, dark colored objects absorb the most solar energy and heat faster than light colored objects. If an object absorbs enough heat from the Sun, significant thermal anomalies may be hidden and go undetected. As there is no way to compensate or correct for solar loading, the most prudent course of action is avoidance. Solar loading can be avoided by imaging on cloudy days, at night, or early in the morning. Solar loading can also be overcome by shading an exposed target and waiting for the object’s temperature to return to normal. Identifying and overcoming environmental error sources such as solar loading is one of the many topics covered in depth within the Infraspection Institute Level I Certified Infrared Thermographer® training course. For more information on course dates or to register for a course, call 609-239-4788 or visit Infraspection Institute online. Lightning is one of the most spectacular natural phenomena. For thermographers who work outdoors, it can present a serious safety hazard. This week’s Tip discusses how you can protect yourself from this serious safety hazard. Each year, lightning kills an average of 67 people in the United States; hundreds more are injured. Few people really understand the dangers of lightning. Many fail to act promptly to protect their lives and property don’t understand the dangers associated with thunderstorms and lightning. Thunderstorms are most likely to develop on warm summer days and go through various stages of growth, development and dissipation. On a sunny day, as the sun heats the air, pockets of warmer air start to rise in the atmosphere. When this air reaches a certain level in the atmosphere, cumulus clouds start to form. Continued heating can cause these clouds to grow vertically upward in the atmosphere into “towering cumulus” clouds. These towering cumulus may be one of the first indications of a developing thunderstorm. During a thunderstorm, each flash of cloud-to-ground lightning is a potential killer. The determining factor on whether a particular flash could be deadly depends on whether a person is in the path of the lightning discharge. In addition to the visible flash that travels through the air, the current associated with the lightning discharge travels along the ground. Although some victims are struck directly by the main lightning stroke, many victims are struck as the current moves in and along the ground. Lightning can strike as far as 10 miles away from the rain area in a thunderstorm. That’s about the distance you can hear thunder. When a storm is 10 miles away, it may even be difficult to tell a storm is coming. IF YOU CAN HEAR THUNDER, YOU ARE WITHIN STRIKING DISTANCE. SEEK SAFE SHELTER IMMEDIATELY! The first stroke of lightning is just as deadly as the last. If the sky looks threatening, take shelter before hearing thunder. Once indoors, stay away from windows and doors and avoid contact with anything that conducts electricity. Wait at least 30 minutes after the last clap of thunder before leaving shelter. It is a typical roof inspection using an infrared imager to locate hidden moisture. The roof is in pretty good shape and no exceptions have been located on the first two sections. Walking across the third roof section, the first exception is spotted. It is a small one, roughly 2’ x 2’, and appears to be half of a 2’ x 4’ Perlite board. Stepping in the middle of the exception reveals the softness created when board type insulation becomes wet. With a small exception like this, it is tempting to mark it and move on to the next, but first let’s check it with our capacitance meter. Sure enough, the meter pegs the needle, but to make sure we whip out the pin-type moisture meter. Inserted into the center of the area, it also pegs the needle. So now we have a footstep and three advanced pieces of technology that all agree the roof is wet, or do they? The footstep only tells us the roof was slightly softer in that area. The infrared imager only reports that the radiated energy was slightly higher. The capacitance meter only reports that the electrical impedance of the area is different from the area around it. The pin-type meter only reports that it encountered a different electrical resistance. In order to confirm the presence of moisture we take a core sample of the roof. What we found was a piece of sheet metal laid below the membrane, apparently to cover the opening left by an old vent pipe that had been removed. The metal changed the radiated energy seen by the imager, the impedance seen by the capacitance meter, the resistance seen by the pin-type meter and small hole in the deck changed the firmness felt by the footstep. All these were good reasons to suspect a wet area but none good enough to verify one, even when all four agreed. This is an old tip, but one worth revisiting. This exception was actually encountered on a recent inspection and could have been misinterpreted had the roof not been cored to confirm or deny the other results. Perhaps a good way to understand the importance of core cuts is to realize that the visible evidence of a core is the only method of investigation that determines if a roof is wet or dry. Infrared imagers, nuclear gauges, capacitance meters and even pin-type resistance moisture meters can only be used to narrow down areas of the roof and limit the number of cores that must be taken. So if you are in the business of roof moisture surveys, your primary tool is a core cutter. You just use the fancy equipment to tell you where to do the real work. As thermography gains wider acceptance, the number of firms offering infrared inspections continues to grow. A common challenge among thermographers is obtaining appropriate insurance coverage for their inspection activities. Insurance is a necessary expense in the modern business world. Depending upon a where a business is located, certain types of insurance (unemployment, automobile, workers compensation) and the amount of coverage may be mandated by law. General liability insurance which is designed to protect against an insured against a legal claim often evokes the greatest number of questions. For professional thermographers, the challenge in obtaining the correct type of insurance and the amount of coverage will depend upon several factors. These include, but are not limited to, the location where work is to be performed, the types of inspections to be conducted, thermographer training and experience, and the content of any reports to be issued. In order to best determine insurance needs, a thermographer should consult with their insurance broker or agent who can provide the best guidance on insurance options. In the absence of a current insurance professional, consider asking for a referral from another local business. When seeking insurance, consulting with more than one insurance professional will likely provide both policy and pricing options. Infraspection has been training and certifying thermographers for over 25 years. Since 1983, our Certified Infrared Thermographer® program has been setting the standard for excellence among professional thermographers worldwide. For information on training courses and certification, contact Infraspection Institute at 609-239-4788 or visit www.infraspection.com. First impressions not only count but they can last a long time. Bad impressions can last forever especially if their source is constantly in public view on an internet message board. Humans leave their mark everywhere they go. They leave fingerprints on the things they touch, footprints in the sand where they walk, and personal impressions on those they meet. A less considered type of impression is an ‘internet footprint’ which is created whenever a person posts to public message boards or blogs. Web posts often make permanent impressions on those who read them. Web posts that are timely, accurate, and professional can serve to help others and create a positive image for their authors. Bad or inappropriate posts can cause permanent damage and even harm one’s business. When posting on the net, following a few simple rules or netiquette can help to avoid creating a bad impression in cyberspace. Avoid over exposure. Chronic posting or posting ‘round the clock gives the impression that you have nothing better to do. Keep in mind that posts can be viewed worldwide across different languages and cultures. Humor and witticism rarely translate well; sarcasm is often magnified. Lastly, remember to think before you hit the ‘send’ button. Web posts often have an unintended permanence and are available for the world to see. Webmasters are rarely under any obligation to remove or edit posts regardless of how unflattering they may be. The American Society for Nondestructive Testing document, SNT-TC-1A provides suggested curricula and experience for under the Thermal/Infrared test method. Recommended curricula and the classroom hours are listed below; these should be modified to meet an employer’s needs. In short, it is up to an employer to determine his/her client’s needs for and to set certification requirements accordingly. Taken at face value, certification generally indicates one’s level of formal training. This training, combined with experience and knowledge of the system or structure being inspected determine a thermographer’s qualifications. In a larger sense, certification is a measure of a thermographer’s professional qualifications. It is therefore incumbent on the professional thermographer to achieve the highest level of certification possible. The rewards for doing so are both personal and professional and can provide significant financial and competitive advantages. Infraspection Institute has been training and certifying professional infrared thermographers since 1980. Our Level I, II, and III Certified Infrared Thermographer® training courses are fully compliant with ASNT and industry standards. Students may choose from open-enrollment and convenient web-based Distance Learning Courses. For more information or to register for a class, call 609-239-4788 or visit us online at www.infraspection.com. With much of the US experiencing record setting heat, it is hard to think about winter. For many, autumn provides a perfect opportunity to conduct infrared inspections of flat roofs to help ensure that they are ready for the upcoming colder months. Summer can be especially tough on roofing systems. High temperatures, building movement, and UV radiation often cause cracks and splits in the waterproofing system. Left undetected, these cracks and splits can lead to roof leaks and premature roof failure. Performing an infrared roof inspection prior to the onset of colder weather can detect evidence of problems and help to direct repair efforts. Performed under the proper conditions with the right equipment, an infrared inspection can detect evidence of latent moisture within the roofing system often before leaks become evident in the building. For many locations, autumn provides perfect conditions for conducting an infrared inspection and performing any necessary roof repairs. The best candidates for infrared inspection are flat or low slope roofs where the insulation is located between the roof deck and the membrane and is in direct contact with the underside of the membrane. Applicable constructions are roofs with either smooth or gravel-surfaced, built-up or single-ply membranes. If gravel is present, it should be less than ½” in diameter and less than 1” thick. For smooth-surfaced roofs, a short wave (2-5.6 µ) imager will provide more accurate results especially if the roof is painted with a reflective coating. All infrared data should be verified by a qualified roofing professional via core sampling or invasive moisture meter readings. Infrared inspection of flat roofs and proper equipment selection are two of the many topics covered in the Infraspection Institute Level I Certified Infrared Thermographer® training course. For more information or to register for a course, visit Infraspection Institute or call us at 609-239-4788. A common question among thermographers is, “How much temperature differential is needed to obtain good data?” In this two-part Tip, we discuss required temperature differentials for infrared inspections of buildings. Proper conduct of any infrared inspection requires that a detectable temperature differential or Delta T is associated with the sought-after defect at the time of inspection. For infrared inspections of buildings and their subsystems, the appropriate time for an infrared inspection will depend upon, but not be limited to: the type of condition or defect, time of day, local atmospheric conditions, and imaging vantage point. For building energy loss inspections, published standards require an inside/outside temperature differential of 10 C or 18 F degrees for at least 3 hours prior to the inspection. Such a differential will help to ensure that there is adequate heat flow through structural components necessary for an accurate inspection. 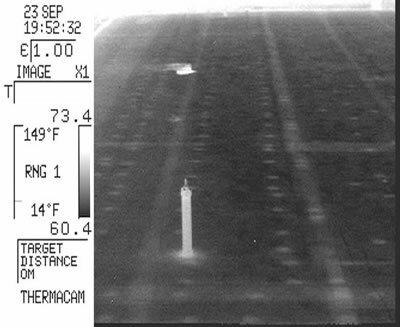 While it is possible to conduct energy loss inspections with a lesser inside/outside temperature differential, the likelihood of missing defects increases with a decrease in Delta T.
IR inspections to detect building energy loss may be conducted from either the interior or exterior of a building; however, imaging from the interior is often more comprehensive and useful than macro shots taken exclusively from the exterior. Regardless of vantage point, one must make certain to account for the effects of solar loading, especially when imaging during daytime hours. Thermal patterns associated with missing or damaged insulation may appear warm or cool depending upon vantage point and site conditions. In addition to the above, detecting latent moisture within or evaporating from building materials assumes a relatively high target emittance. Low emittance surfaces associated with metal building facades or roofs coated with aluminum paint may not lend themselves to an accurate infrared inspection. Lastly, all infrared data should be verified by independent means, as appropriate. This testing may include visual and/or invasive moisture meter readings. Infrared inspection of buildings is of the many topics covered in the Infraspection Institute Level I Certified Infrared Thermographer® training course. For more information or to register for a course, visit Infraspection Institute or call us at 609-239-4788. For detecting latent moisture within EIFS structures or insulated roofs, an inside/outside temperature differential is not necessary. For these applications, the IR inspection is traditionally conducted from outdoors during evening hours following a sunny day. Areas of latent moisture will typically show as warm areas since water will store and retain more solar energy than areas containing dry insulation. For damage investigations, directly imaging wet building materials will usually result in well-defined amorphously shaped patterns. This application does not require an inside/outside temperature differential or solar loading. Rather, thermal patterns associated with moisture can be readily detected provided that water is evaporating at the time of inspection. For drywall, water may evaporate into the living space or into cavities behind the affected drywall. In most cases, water evaporating from a material will cause wet areas to appear cool. 2009 H1N1, sometimes called “swine flu”, is a new influenza virus that is spreading worldwide among people. Because this virus is very different from current seasonal influenza viruses, many people will not have protective immunity against it and and the seasonal flu vaccine will not protect against it either. Influenze is unpredictable, but this flu season could be worse than recent years because of the 2009 H1N1 virus. The Centers for Disease Control and Prevention are preparing for an early flu season and expects both 2009 H1N1 virus and seasonal flu to cause illness, hospital stays, and deaths this season. How does 2009 H1N1 flu spread? Both 2009 H1N1 flu and seasonal flu are thought to spread mostly from person to person through the coughs and sneezes of people who are sick with influenza. People may also get sick by touching something with flu viruses on it and then touching their mouth or nose. How long can a sick person spread 2009 H1N1 flu to others? People infected with 2009 H1N1 flu shed virus and may be able to infect others from 1 day before getting sick to about 7 days after getting sick. This can be longer in some people, especially children and people with weakened immune systems. How severe is illness associated with this 2009 H1N1 flu virus? 2009 H1N1 flu illness has ranged from mild to severe. Most healthy people who have been sick with 2009 H1N1 have recovered without needing medical treatment; however, hospitalizations and deaths from 2009 H1N1 have occurred. Who is at greatest risk of infection with this new virus? So far, younger people have been more likely to be infected with 2009 H1N1 flu than older people. Most cases of 2009 H1N1 have occurred in people younger than 25 years of age. At this time, there are relatively few cases of 2009 H1N1 in people 65 or older, which is unusual compared with seasonal flu. What can I do to protect myself from getting sick from 2009 H1N1 flu? CDC recommends a three-step approach to fighting the flu: vaccination, everyday preventive actions including frequent hand washing and staying home when sick, and the correct use of antiviral drugs if your doctor recommends them. Everyday actions can help prevent the spread of germs that cause respiratory illnesses like influenza. Stay home if you are sick. CDC recommends that you stay home from work or school and limit contact with others to keep from infecting them. Be prepared in case you get sick and need to stay home for several days; a supply of over-the-counter medicines, alcohol-based hand rubs, tissues, facemsks, and other related items might be useful and help avoid the need to make trips out in public while you are sick and contagious. If you become ill with influenza-like symptoms this flu season you should stay home and avoid contact with other people except to seek medical care. Most people have been able to recover at home from 2009 H1N1 without needing medical care and the same is true of seasonal flu. For more information on 2009 H1N1, visit www.cdc.gov/h1n1flu or call 800 CDC-INFO. If you get sick with flu-like symptoms this flu season, you should stay home and avoid contact with other people except to get medical care. Most people with 2009 H1N1 have had mild illness and have not needed medical care or antiviral drugs and the same is true of seasonal flu. Also, it’s possible for healthy people to develop severe illness from the flu so anyone concerned about their illness should consult a health care provider. There are emergency warning signs. Anyone who has them should get medical care right away. What are the emergency warning signs? No. The emergency room should be used for people who are very sick. You should not go to the emergency room if you are only mildly ill. If you have the emergency warning signs of flu sickness, you should go to the emergency room. If you get sick with flu symptoms and are at high risk of flu complications or you are concerned about your illness, call your health care provider for advice. If you go to the emergency room and you are not sick with the flu, you may catch it from people who do have it. Are there medicines to treat 2009 H1N1? Yes. There are drugs your doctor may prescribe for treating both seasonal and 2009 H1N1 called “antiviral drugs.” These drugs can make you better faster and may also prevent serious complications. This flu season, antiviral drugs are being used mainly to treat people who are very sick, such as people who need to be hospitalized, and to treat sick people who are more likely to get serious flu complications. Your health care provider will decide whether antiviral drugs are needed to treat your illness. Remember, most people with 2009 H1N1 have had mild illness and have not needed medical care or antiviral drugs and the same is true of seasonal flu. How long should I stay home if I’m sick? CDC recommends that you stay home for at least 24 hours after your fever is gone except to get medical care or for other things you have to do and no one else can do for you. (Your fever should be gone without the use of a fever-reducing medicine, such as Tylenol®.) You should stay home from work, school, travel, shopping, social events, and public gatherings. What should I do while I’m sick? Stay away from others as much as possible to keep from making them sick. If you must leave home, for example to get medical care, wear a facemask if you have one, or cover coughs and sneezes with a tissue. And wash your hands often to keep from spreading flu to others. Infrared inspections of electrical distribution systems frequently include motor controllers. Proper imager settings and inspection technique are imperative In order to accurately inspect these critical electrical devices. Industrial motors of all sizes are frequently controlled by remote devices known as motor controllers. Motor controllers are small to large metal-clad devices containing one or more large solenoids that provide manual or automatic control of motor functions including: starting/stopping, motor speed, torque, and rotation direction. Motor controllers may be installed as individual units or grouped with others in motor control centers. Motor controllers often contain a number of electrical devices operating at widely differing temperatures. These devices include control circuits, transformers, fuses, circuit breakers, contactors, thermal overloads, and circuit conductors. The temperature of these devices can range over hundreds of degrees. Image from a distance that permits viewing only of the subject controller components. For controllers with multiple contactors, it will be necessary to inspect each contactor individually while under load. Be sure to allow sufficient time for subject contactor to achieve running temperature. Lastly, be certain to observe all necessary safety practices when working on or near energized electrical equipment. “Energy nearly gone . . . Must finish . . .” When incorporated into a movie script, such a quote can provide high drama; spoken by a thermographer, it could foretell of temperature measurement errors. Experienced thermographers know what it feels like to be near the end of an inspection only to have a low battery indicator appear on their instrument’s display screen. When fresh batteries are unavailable or far away, thermographers are often tempted to try to finish their inspection without switching batteries. Although many portable thermal imagers and radiometers are designed to be used with batteries, few thermographers appreciate the impact of supply voltage on temperature measurement. Using infrared equipment with low batteries or incorrect voltage can cause significant errors in temperature measurement. Because of this, it is imperative to ensure that equipment batteries are always fully charged. Lastly, when working away from your office, it is a good practice to keep your battery charger(s) handy. Doing so will enable you to recharge dead batteries while you continue to work, helping to ensure that fresh ones are available when you need them. Infraspection Institute Certified Infrared Thermographer® training courses teach the proper use of thermal imagers and radiometers along with proven techniques to help ensure accurate temperature measurement. For more information or to register for a course, call 609-239-4788 or visit us online at: www.infraspection.com. Thermal imaging is a proven technique for detecting latent moisture within low-slope roofing systems. Under the right conditions, thermal imaging may also indicate the number and location of roof fasteners. Mechanical fasteners are a critical component in flat roofs. Essentially large sheet metal screws that are installed through large steel or plastic plates, mechanical fasteners secure sheets of insulation to the roof deck. In order to help ensure roof system performance, it is critical that each insulation board is installed with a sufficient number of fasteners. An insufficient number of roof fasteners may be the result of improper design or a contractor attempting to cut corners on material. When fastener quantity is in doubt, a thermal imager may be used to indicate the number and location of fasteners. Typically, fasteners and plates will show as relatively warm components against a cooler background when imaged post-sunset after a sunny day. In the image below, subsurface fasteners and steel plates show as regularly-spaced warm circles. Infrared inspections of flat roofs are one of the many applications covered in the Infraspection Institute Level I Certified Infrared Thermographer® training course. For course schedules or to obtain a copy of the Standard for Infrared Inspections of Insulated Roofs, visit Infraspection Institute online or call us at 609-239-4788. Savvy business owners are always on the lookout for new business opportunities. Thermography can be a particularly good fit for building and home inspectors seeking to expand their services and generate new revenue. The past few years have seen tremendous growth in the use of thermography for building inspections. Greater public awareness and lower equipment costs have induced many home and building inspectors, damage restoration specialists and pest management professionals to add thermography to their services. Determine your firm’s capabilities with respect to expertise and manpower. Conduct a marketing study to determine what services you will offer. In particular, look for services that will repeat annually and/or provide the greatest revenue with the least amount of sales effort. Entry level equipment can limit one’s capabilities and revenue potential. Try to anticipate your equipment needs for at least three years and purchase accordingly. Despite claims to the contrary, thermography is not a ‘point and shoot’ technology. In addition to thorough knowledge of the systems or structures being inspected, thermographers should be trained in infrared theory, heat transfer concepts, equipment operation and selection, current industry standards, and report generation. For those lacking experience, training should be completed prior to purchasing equipment. Infrared inspection of buildings and their subsystems is one of the many topics covered in the Level I Infraspection Institute Certified Infrared Thermographer® training course. For information on thermographer training including course locations and dates, visit us online at www.infraspection.com or call us at 609-239-4788. As the popularity of switchgear windows and ports grows, thermographers are faced with challenges unique to these devices. In this Tip we examine some of these challenges and provide advice and cautions when imaging through windows and ports. In an effort to reduce the risk of injuries associated with arc flash, many facilities have installed IR transmissive windows or ports that permit infrared inspections without having to open panel covers. Although windows and ports can provide a measure of safety and help to reduce labor associated with infrared inspections, they pose unique challenges not associated with direct line-of-sight imaging. Switchgear windows are typically constructed of a metal frame with a fixed IR transparent material that enables an imager to view through them. Switchgear ports consist of a metal frame with small openings through which an imager may be sighted. Depending upon type, some ports have a single hole; others have metal screens containing multiple holes. When it is not possible to meet all of the above conditions, imagery should be evaluated only for its qualitative value. As always, any inexplicable hot or cold exceptions should be investigated for cause and appropriate corrective action taken. The Infraspection Institute Standard for Measuring and Compensating for Transmittance of an Attenuating Medium Using Infrared Imaging Radiometers provides procedures for calculating window transmittance which is critical to accurate temperature measurement. To obtain a current copy of the Standard, call 609-239-4788 or visit our the standards area of our online store.